Brown hamburger in dutch oven. Add taco mix, water, and liquid from can of corn. Reduce the heat to about 225 degrees. 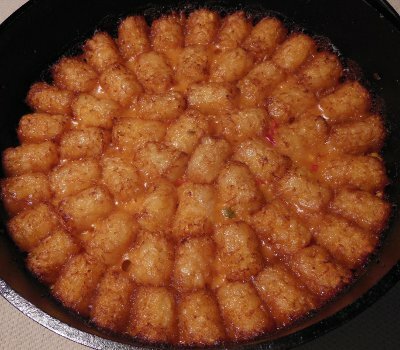 Place tater tots in one even layer on top, filling all open spaces. Don't use all the tater tots if they won't fit. Cover with lid, and move some of the heat to lid to Bake at about 350 degrees for about 50 minutes. Move all the coals to the lid and cook for 15 minutes longer, to crisp the tots. Let me know how you enjoyed your Taco Tots! Totally off the hook! 19 scouts, 9 adults, 4 batches of Taco Tots, zero leftovers. People were licking the dutch ovens. Not literally, that's gross. What's is Nacho Cheese Soup? What brand did you use? Can or dry mix? This makes for great late night food. I recommend draining the beef once its browned, otherwise it gets a bit greasy.